Have you ever made mango salsa? How about fermented mango salsa? Yup, me neither. 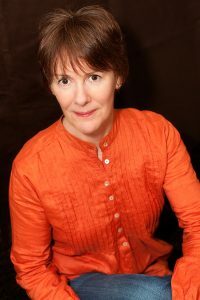 So when fellow Nutritional Therapist, Trish Carty, a fermentation expert, contacted me about doing a guest post for a fermented mango salsa, I was all for it. In fact, this is the first ever guest post on Fearless Eating! Hello everyone! Glad to be here on Fearless Eating and I’m super honored to be Craig’s first guest poster! 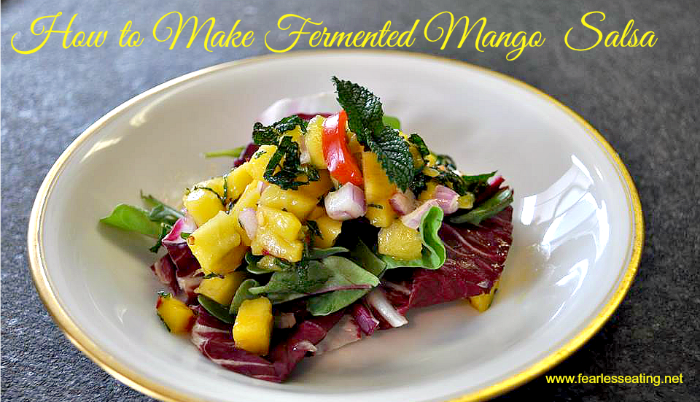 Before I share my recipe for fermented mango salsa, let me give you a little background on it. chartered sailboat. I was fortunate to have a captain who loved the best local foods we could get. He knew what islands had the best mangoes, pineapples, coconuts and all locally grown foods. I created weekly menus reflecting these foods for the vacationing guests. Since our charter guests were new every 10 days or so, the favored meals quickly became apparent and mangoes were always a part of them. reliable supply at each port of call. Guests loved seeing the local foods delivered to the boat. the boat, grill and serve with a squeeze of lime and the mango salsa. Local steamed greens were served as a simple but delicious side dish with this meal. The colors and combinations of flavors were perfect. Once I learned about fermentation I realized how simple it could be to make this into a fermented mango salsa recipe. Even better, the process of lacto-fermentation adds a depth and complexity to the flavors. And even better still, additional nutrients are developed via the lacto-fermentation process which also aid digestion. These are just some of the reasons why lacto-fermented foods are so important. Use this simple Fermented mango salsa as a side dish or topping for grilled fish or other meats. 3 TBSPs fresh mint, cut chiffonade style - roll leaves lengthwise and thinly slice. 1 tsp fresh lime juice, reserve for plating along with lime slices and mint sprigs. I like to squeeze a little splash of lime juice for the final presentation and garnish with lime slices and mint sprigs. Peel mango and dice into about 1/2 inch cubes and place in mixing bowl . Move the ingredients to your fermentation vessel. I prefer an airlock method. Pack lightly to submerge all the ingredients under liquid. Leave in a cool dark place for 8-24 hours. Fermentation time is relatively short as the fruit does tend to quickly ferment. Taste and place in refrigerator when ready. Eat within 10-14 days. The herbs can be varied to enhance the style of the food you are serving. Cilantro or basil can be substituted for the mint. Any salad. I love it with with and endive, shrimp and goat cheese salad. On it’s own as a fresh fruit salad!